The CSI team participates in a multidisciplinary approach involving the physician, nursing, rehabilitation therapy and any other hospital department based on patient needs. 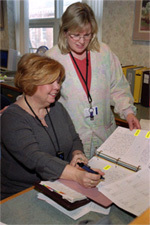 Within 24 hours of admission a Continuing Care Coordinator will visits the patient to assess the medical needs, home setting and support systems to begin the discharge planning process. Several meetings with the patient and/or family may be necessary to determine any barriers to discharge or special needs of the patient and/or family. For general questions about discharge planning or any other CSI functions, you may also email the department at csi@bidplymouth.org. Due to the nature of electronic communications, Beth Israel Deaconess - Plymouth cannot and does not provide any assurances that the contents of your email will not become know or accessible to third parties. Please do not provide any confidential information about you or your health to Beth Israel Deaconess - Plymouth via electronic communication.